How To Effectively Speed Up Translation Process? There are many factors that contribute to a successful translation project management. After all, the most important thing is your translation project being handled in an effective way, but what does it really mean? Well, it means that the translation quality is high, the costs are low and the turnaround time is as expected. Having all three factors combined, you can expect that everything will go as planned. We already wrote about quality and costs and we can all agree that in translation projects, the turnaround time plays an important role. That’s why today we will point out 5 tips that will help you speed up the translation process! Setting deadlines – when creating a project, you are able to choose a deadline for the translators that helps to set the timeline for the whole project. Add reference files and instructions – You are able to add detailed instructions with reference files for each project. Reference files will provide insight into the overall translation project while you are also able to upload reference images for individual segments – which is mostly used for more insight into the UI of your software localization projects. For video files, you can add an actual video as a reference! 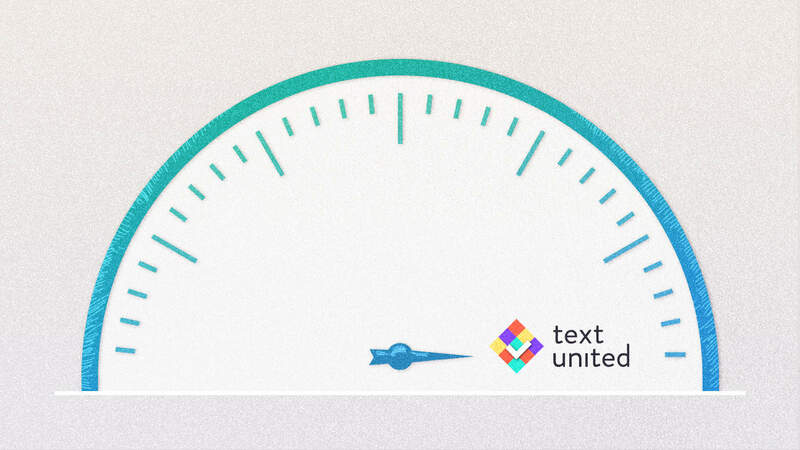 Collaboration – At Text United, the translation editor is a collaborative platform. Translators and proofreaders will be able to exchange comments and make changes to segments. While the reviewer can approve or reject translations and the translator will be able to filter out rejected segments and correct them. Communication is the key to fast problem-solving! For advanced project management, we recommend using the Text United desktop app that allows you to use flags to mark projects for your team. Like this, they know what’s the status of the project. Flags can be also used as notifications when a project has been accepted by the client, when the project is facing some issues that were not expected or when the project is ready for closing. The most important thing is to be up-to-date. Translation Memory speeds up the translation process by automatically looking up any previously translated similar or identical sentences. The degree of match between the source segment and a Translation Memory segment is expressed as a percentage figure. This means that once you translate a document, make changes to it and want to translate again – you only translate the content that has changed, while the rest will be pulled from Translation Memory into to project. When it comes to outsourced projects, Translation Memory will also reduce the costs depending on how many matches you have. Integrating Bitbucket and Github into your Translation Management System will speed up software localization significantly. The integration allows for seamless file syncing between your repository and translation project. Once files are updated or new files are added to the repository, they will be synced to your translation projects. Translators will receive notifications about the update and they can start working immediately. No time wasted! Machine translation has improved tremendously since it’s beginnings and the literal word-to-word translation. Nowadays you can immediately pre-translate your project and simply assign it to a human translator to make corrections if necessary. As you imagine, this process is much faster than translating from scratch. Outsourced MT projects are also up to 40% cheaper than regular translation projects (depending on the language combination). This means time and money saved!